A friend recently wanted to make dinner for her boyfriend (eek, now fiance!) and asked for my help. We got together, test-drove the recipe and she re-created it for him a few weeks later. While brainstorming what she wanted to make for him, she told me he liked spicy, peppers and seafood. This isn’t exactly the easiest list of ingredients, but this recipe came out so well. 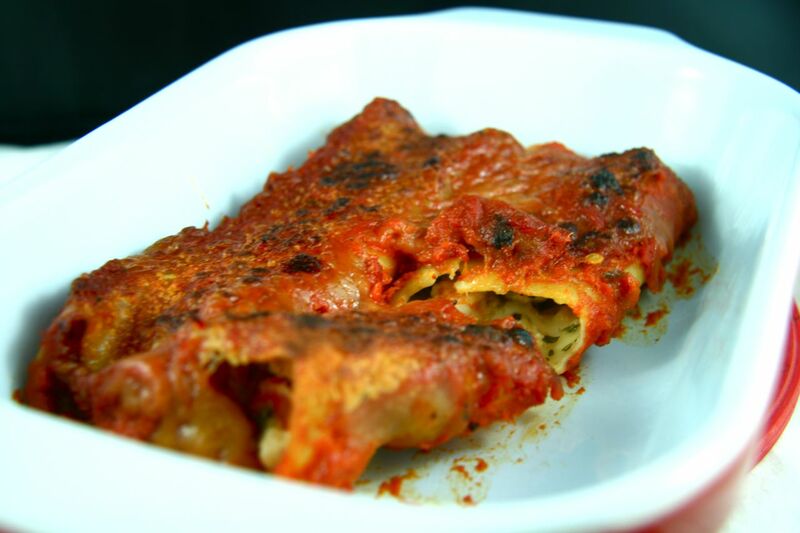 A spicy roasted red pepper sauce with shrimp stuffed into cannelloni, absolutely delicious. It was a hit with everyone who got to enjoy it (CH was taste tester #1) and then when my friend made it for her boyfriend, he was very pleased. Definitely a fun twist on a pasta dish – the roasted red pepper sauce is a must make again; it would be delicious on chicken or over pasta for a quick weeknight meal. Preheat your broiler to high. Wash and dry the red peppers and place directly under the broiler. Broil the peppers, rotating frequently, until all sides are black and blistered. Remove from oven and place in a glass bowl and cover immediately with saran wrap. Allow peppers to sit for at least 10 minutes. When cool enough to touch, remove peppers and peel off the blistered skin and remove the seeds from the inside. While the peppers are sitting, heat 2 TBSP of olive oil in a medium sized skillet over medium heat. Add the onions to the pan and sauté until translucent. Add in garlic and sauté with the onions for 30 seconds, or until fragrant. At this point, split the onion mixture into two even portions (don’t measure, just eyeball it). Place half of the onion mixture in a glass bowl, place the other half in a blender. Add the peeled and de-seeded roasted red peppers to the blender, along with the onion mixture. To the blender, also add 2 heaping TBSP hot sauce (sriracha), 2 TBSP tomato paste, 1/2 tsp chili powder), 1 tsp sugar, 1/2 cup of water and a generous dash of salt and pepper. Reserve the sauce until the pasta is ready to bake. In the bowl with the other half of the onion mixture, add the diced shrimp, goat cheese, mozzarella, parsley and S&P. Mix the shrimp mixture and stuff the manicotti shells evenly with the mixture. 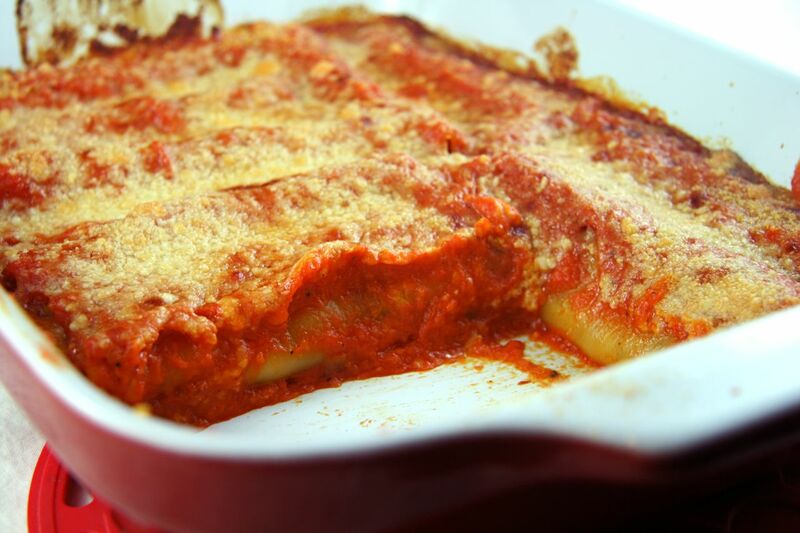 Place the stuffed shells in a 9×12 baking dish and pour the reserved sauce over pasta shells, ensuring they are evenly covered. Cover the baking dish with foil and bake the pasta 25-30 minutes. Serve with a salad and fresh bread and ENJOY! A JBean Cuisine Original Recipe (inspired loosely by CookingLight Shrimp Stuffed Shells recipe seen here).